In all the posts we’ve done here at The Midnight Tracker, we’ve never done a soundtrack. So tonight on The Midnight Tracker, we remedy that. This format, one side of an album at a time, lends itself to presenting soundtracks whose producers clearly have given some thought about what goes where, from start to finish. Ever since I came across Willie Hutch’s debut album, “Soul Portrait,” at a record show last summer, I’ve been looking for more Willie Hutch. A couple of weeks ago, I couldn’t believe what I saw in the bins at Amazing Records, our local used record emporium. 1. I will buy this for the cover alone. Pam Grier! 2. I will buy this because it’s a Willie Hutch record. It did not disappoint on either count. I’ve never seen “Foxy Brown,” so I’m hearing the music for the first time, and only in the context of the album. That never stopped me from digging the soundtrack to “Shaft,” which I finally saw about 30 years after it came out. Or the soundtrack to “Superfly,” which I’ve still never seen. Late to the party as always. The second cut, “Theme of Foxy Brown,” was released as a single in 1974, the year the film came out. It reached No. 64 on the Billboard R&B chart. 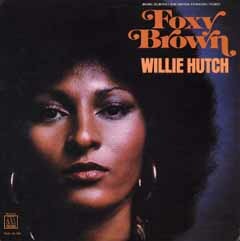 “Chase,” “Theme of Foxy Brown,” “Overture of Foxy Brown,” “Hospital Prelude of Love Theme,” “Give Me Some Of That Good Old Love” and “Out There,” Willie Hutch, from the “Foxy Brown” soundtrack, 1974. It’s out of print but is available digitally. This is Side 1. It runs 14:47. All the cuts are written and performed by Hutch, who a year earlier had done the soundtrack to “The Mack,” another blaxploitation film. Two singles from that record — “Brother’s Gonna Work It Out” and “Slick” — reached No. 18 on the Billboard R&B chart. As for “Foxy Brown” the movie, most of the folks who are into ’70s blaxploitation films say it isn’t as good as “Coffy,” which preceded it. Grier plays a tough, nasty vigilante in both films. I doubt either film played in my hometown in central Wisconsin in 1973 or 1974.